Brad and Angelina have rented a pad on the North Shore of Long Island while she films some spy thriller. Check out the house. I know you want to. I think that house could eat about 20 houses like mine. You have eclectic taste in houses, Laura. Back when I was in HS, for fun my friends and I would drive up to Lloyd Neck to try to find Billy Joel’s house. We heard he had a big harpsichord in the window. LOL, we’d never get away with doing that today. We also used to drive up and down Sunrise Highway in PequaLand looking for the Stray Cats. What can I say? We didn’t drink, we didn’t smoke. We had to find something to do. I’m not as much a fan of the house as the waterfront property and the location to Manhattan. I am a fan of Tudorish houses. 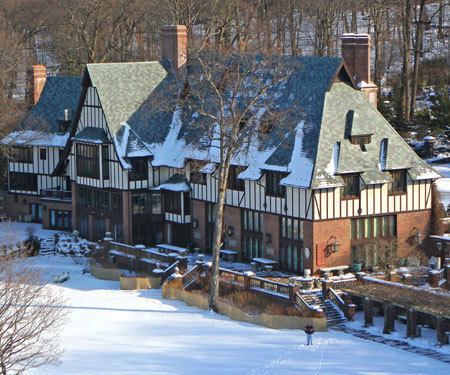 One nice thing about Pittsburgh is that you can find some Tudors in nice neighborhoods for prices that would keep the mortgage payment lower than the heat bill on that place. Of course, they are smaller (probably topping out at 3,500 square feet) and much less convenient to the water and Manhattan. It’s large, ugly, and in a desolate location. Just my opinion, though! I think it’s just the right size for one of those Agatha Christie house parties where 15 people are invited down for the weekend. Amy P, I don’t think it has enough bedrooms for 15 guests. Depends on the age of the house, of course. I’ve seen houses built in the last 10 years which look to be about the size of this Tudor, but have 4 bedrooms. Really, really, large bedrooms, each with its own bathroom. A tremendous waste of space! I’m guessing the house is old. Almost no way that tree in front pre-dates the house. MH, Google “mature tree transplanting.” If we’re looking at the same trees, I think they were planted to reflect in the reflecting pool. The (maybe) old house has new windows, and I’d guess it has many security features. With enough money, anything is possible. We may be looking at different trees. I was just looking at the one tree right by the porch on the picture above. It’s taller than the house. I am completely ignorant of Long Island and its ways (unless you count Barefoot Contessa). Moving a 50 foot tree hadn’t occured to me.